TULSA, OKLA. – The Arizona Rattlers remain in the top spot of the Coaches’ Poll, receiving 15 first place votes following their 48-47 victory over the Orlando Predators in an early-season thriller. The Rattlers put together a comeback in the last 27 seconds of their Week 4 game that earned the squad the Spalding Highlight of the Week. It began when Arizona DB Virgil Gray intercepted a tipped pass on the Rattlers’ five-yard line. On the next play, QB Nick Davila hit WR/LB Jason Geathers for a 31-yard gain. Two plays later, Davila and Geathers connected for a touchdown. With eight seconds to play, Davila found WR Trandon Harvey on a two-point conversion in the back of the end zone to give the Rattlers a one point victory. The Cleveland Gladiators earned three first place votes and jumped up to second place in the Poll, following a 55-48 victory over the previously undefeated Chicago Rush. Receiver Troy Bergeron tied a franchise record with six touchdown grabs in the game. Orlando remains in third place, following the one point loss to Arizona. The Predators will try to rebound after their first loss of the season when they play host to the Philadelphia Soul, who are also looking to bounce back after two straight losses. The game is scheduled for 7:30 p.m. EST on Saturday. Jacksonville continues to shoot up the Poll, climbing to the four spot this week after their third straight division victory, a 54-30 win over Tampa Bay. Chicago drops three spots to number five after the loss to Cleveland. The Rush have a bye in Week 5. The Utah Blaze move up three spots to number six in the Poll, following receiver Aaron Boone’s 226-yard performance in the team’s 69-40 win over Dallas in Week 4. The Iowa Barnstormers find themselves in the Coaches’ Poll for the first time this season, as Brad Banks’ record-setting 10 touchdown passes in the team’s 76-69 shootout victory over San Jose propels the Barnstormers into the seven spot. 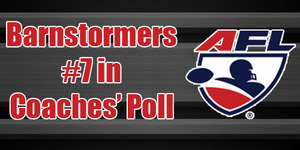 The SaberCats drop from fifth to eighth in the Poll following the loss. San Jose will look to recover in Week 5, as they host Utah, while Iowa will travel to Kansas City in hopes of spoiling the Command’s home opener. Rounding out the top ten are the Dallas Vigilantes at number nine, who fell two spots after a loss to Utah, and the Georgia Force, making their first appearance back in the Poll since Week 1, following a 61-35 win over New Orleans in Week 4. Dallas and Georgia will matchup against each other in Week 5 in the NFL Network “Arena Football Friday” Game of the Week. Kickoff is set for 8:00 p.m. EST. Since its inception in 1987, the AFL has afforded the fast-paced and exciting game of Arena Football to millions of fans in a myriad of markets across the country. The NFL Network will once again broadcast an AFL National Game of the Week for the entire regular and post season on Friday nights at 8:00 pm EST, culminating with the ArenaBowl Championship Game in August.